The stock market is on fire. What could possibly go wrong? Stock market booms don't last forever. History shows that inevitably, something derails the good times on Wall Street. 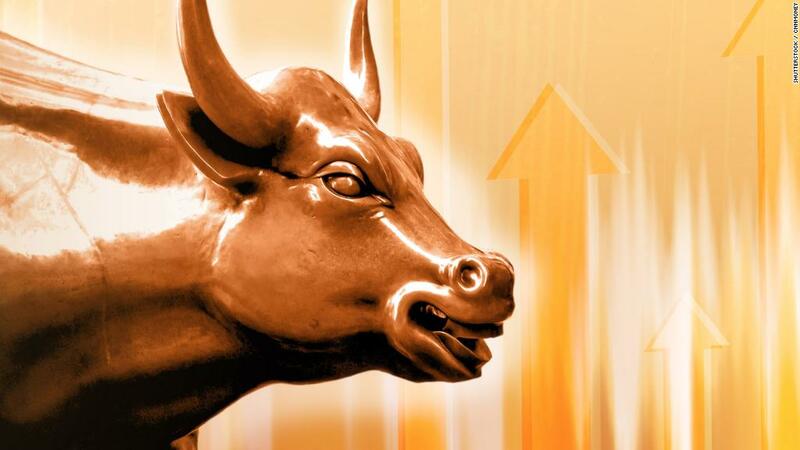 The eight-year bull market looks as strong as ever. 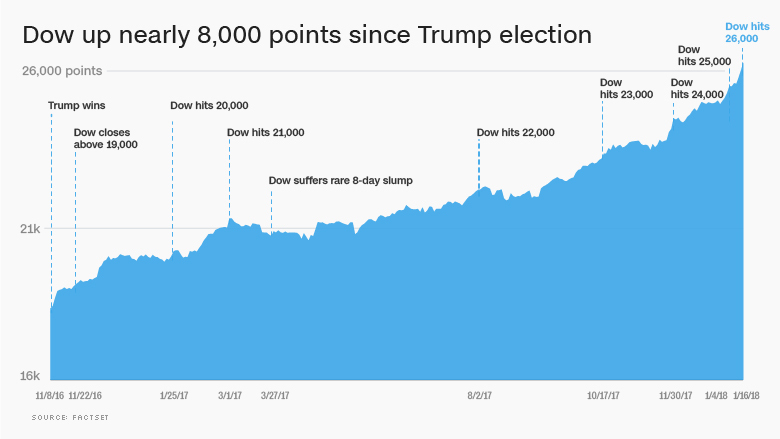 In just the past two weeks, the Dow has blasted through 25,000 and 26,000, capping off a 42% post-election surge. Despite -- or even because of -- that enormous momentum, risks are lurking beneath the surface that could cause the market to unravel. Even if the bull market stays intact for another few years, the market is long overdue to take a breather. The S&P 500 hasn't suffered a pullback of 5%, either in a single day or over several days, since June 2016. If that streak continues until January 22, it'll break the all-time record set in June 2016 of 394 trading days, according to LPL Financial. "The market is euphoric, at least relative to the last five years. It certainly feels stretched," said Nicholas Colas, co-founder of DataTrek Research, a New York-based investment newsletter. Bond market freakout: The bull market in stocks has feasted on extremely low bond rates. That might be changing fast though. The 10-year Treasury rate, which moves opposite price, climbed above 2.6% this week to the highest level since mid-2014. While bond rates remain historically low, a rapid rise above 3% could spook Wall Street. That's because low rates have forced investors to search for returns elsewhere, pushing them into riskier stocks that look cheap by comparison. "For the longest time, the bullish reasoning is that there is no alternative to owning stocks," said Jesse Felder, a bearish money manager who has been predicting a sharp drop in stocks. "With rates rising, that argument is going away." Deficit jitters could pressure rates. The Federal Reserve is shrinking its Treasury holdings just as Washington steps up borrowing to pay for the Republican tax overhaul. Inflation forces the Fed to act: The other key ingredient of the stock market rally has been dormant inflation. Mysteriously low inflation has kept Wall Street happy because it's prevented the Federal Reserve from rapidly raising interest rates. Much higher rates could cause money to shift out of stocks and raise borrowing costs for families and businesses. But there are signs that inflation is starting to slowly come back to life. American companies increasingly can't find the workers they need due to a lack of skilled talent and years of strong jobs growth. That could finally lead to bigger paychecks after years of stagnant wages. The tax law has even led dozens of major companies like Walmart (WMT) and PNC (PNC) to pay $1,000 bonuses and lift their minimum wage. If inflation rises too quickly, the Fed could upset investors by abandoning its promise to hike rates gradually. NAFTA collapses, trade war erupts: Talks between the United States, Mexico and Canada to renegotiate NAFTA have gone nowhere. Trump has repeatedly threatened to withdraw from the trade pact, a move that would create turmoil given how entrenched the 1994 trade deal is in the American economy. Lewis Alexander, chief U.S. economist at Nomura, thinks there's a 40% chance that NAFTA will be ripped up. Consulting firm Oxford Economics warned that killing NAFTA would cost the United States. about 300,000 jobs and cause the S&P 500 to trade 5% lower than it otherwise would. Even if NAFTA survives, a trade war with China or another major trading partner could interrupt strong global growth. North Korea or another geopolitical shock: It's impossible to measure the chance of a military conflict with North Korea or another country. But the risks are higher now than in years past. An incident could threaten the global economy. BlackRock says geopolitical worries mentioned in the media and brokerage reports have jumped to the highest level since March 2015. There is also heightened risk of political turmoil in Washington given the potential government shutdown and ongoing Trump-Russia investigations. Growth shock: The resurgent U.S. economy and renewed strength overseas have fueled much of Wall Street's enthusiasm. Investors are betting that will continue. If growth slowed down unexpectedly following a shock like a natural disaster or terrorism, record-high corporate profits would get dinged, forcing markets to adjust. Nothing stops it, creating a bubble: Sentiment surveys show that investors are extremely optimistic right now. In the past, that has led to out-of-hand risk taking (see: 2000 and 2007). "We're absolutely in the euphoria stage. This is another speculative mania similar to the housing bubble," said Felder. Most analysts don't think it's quite a bubble. But could the tax law change that? Michael Block, chief strategist at Rhino Trading Partners, wrote in a recent report that companies are likely to use the bulk of their tax windfall on stock buybacks and dividend hikes, instead of investing it in the real economy. "This is how asset bubbles are born," Block said. "Money goes to hands and minds that think asset prices go straight up forever."